CPAG (Contemporary Philosophy in the Age of Globalization) is a research project supported by JSPS. The project aims to map contemporary thought, as it unfolds its diverse aspects, and proposes a “new universality” that offers models for human beings and societies living in the present age of globalization. What is contemporary thought ? What are the categories which constitute it ? From these basic questions, we abstract categories such as literary and social criticism, political and existential thought, gender theory, theory of technology, and then analyze them. In addition to these categories, we create new categories in order to make our mapping more precise. 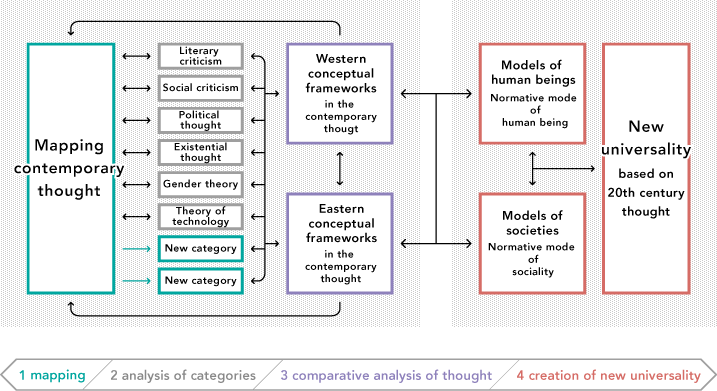 Clarifying the historical context of the conceptual frameworks on which contemporary western thought depends, in order to locate it in the history of thought. Reexaming the contemporary history of thought in Japan, China and Korea, and clarifying the historical context of eastern conceptual frameworks. The 2011 Tohoku earthquake, tsunami, and the severe nuclear accidents have seriously impacted not only Japanese politics, the economy, and society but also the core dimensions of human beings such as culture and thought. In this context, the task of our project is to propose new models that could orient human beings and societies in the wake of the catastrophe, by drawing upon the rich and profound tradition of thought on human existence. CPAG is generously supported by JSPS KAKENHI Grant Number 24242002.